Cordyline fruticosa & Dracaena spp. 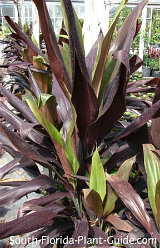 Cordylines and dracaenas have fabulous foliage for dramatic color and provide height and a look of the tropics to South Florida gardens. These colorful foliage plants come in almost endless varieties and provide colors like pink, cream, bronze, lime-green, and red to areas with some shade. Though they're in different plant families, both are easy-care plants. To learn the name of each pictured on this page - as on all photos on this site - run your cursor over the photo. 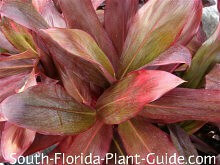 Cordyline plants are typically lumped together and called "ti plants." 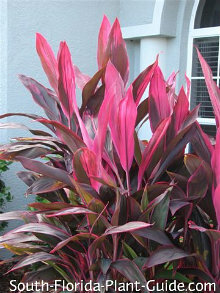 The most popular and commonly grown is "Red Sister" cordyline, with its brilliant fuschia new growth and bronze-magenta leaves. Ti is correctly pronounced "tee," though most of us fall into the habit of saying "tie" simply because everyone seems to do so. 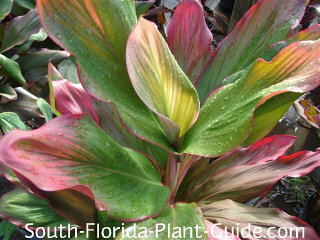 Cordylines show off their best color during cooler weather...a real boon for snowbirds. They're considered a good luck plant in Hawaii where every property seems to have at least one ti plant. Dracaenas, like cordylines, have the benefit of shapeliness - they fit nicely into narrow spaces - and enough height to set off a tropical garden. They're also considered to be deer-resistant. 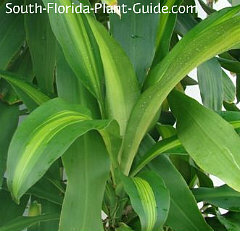 Dracaena marginata, the most well-known of this group, has spiky green leaves rimmed with red. It's a very popular houseplant in northern climates. One, the "Corn Plant" (dracaena fragrans) has extremely fragrant flowers, though the blooms don't look like flowers, more like a bunch of knots on a rope. However if you catch them at dusk tiny white blossoms open in each "knot" to release their heady perfume. The smell is intensely sweet, especially at dusk. 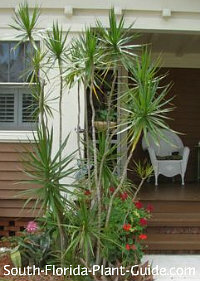 The most common complaint about cordylines is that eventually they can grow tall and leggy, with thin bare trunks (called "canes") and foliage only on top. To encourage a fuller look at varying levels, prune during warm summer weather. To do this, cut off a cane at a lower height and it will usually sprout a new "head" or two from the sides of the cut. Rather than chopping off the heads of all the canes at once, cut the tallest one first. After it sprouts new growth, do the next tallest one. This way some foliage is visible while you're pruning the plant. Plant each cutting back into the ground near the base of the original plant (or start it in a container) - most will root and grow. Heights vary by variety but most of these plants are slow growers. Zone 10 is best but in Zone 9B keep them in containers to move inside during cold weather. Bright shade works fine for all, though some can take more sun than others...morning sun, preferably. You often see ti plants doing fine in sunny areas, but they can become brown-edged and raggedy, so give yours afternoon shade. 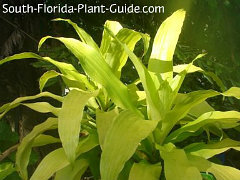 Ask at the nursery when you purchase one of these plants what kind of light it prefers. 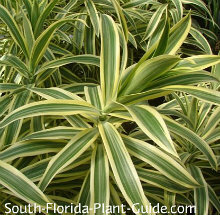 Dracaenas are a bit more drought-tolerant but, with either plant, too-infrequent waterings will cause the tips of the leaves to turn brown. 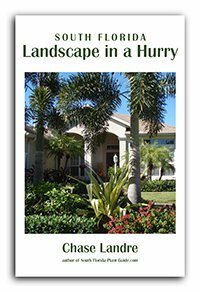 Fertilize twice a year (spring and fall) with a good quality granular fertilizer. 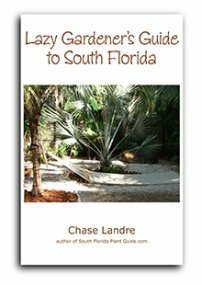 Don't over-fertilize these plants. You can plant groupings of most of these plants very close together for upright plants. A few exceptions are Song of India and Black Magic. Song of India dracaena (dracaena reflexa) - pictured at left - has a swirling, meandering habit, but dracaena marginata, corn plant dracaena and others grow straight up. 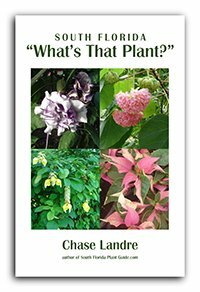 COMPANION PLANT SUGGESTIONS: Variegated ginger, firespike, croton, pinwheel jasmine, hope philodendron, Indian hawthorne, pentas, peace lily, and dwarf tibouchina.